Construction paper There are 16 products. 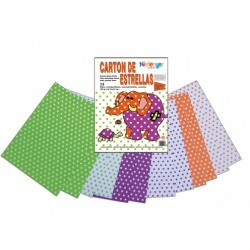 Bags with 12 sheets of construction paper decorated on both sides, with dots in three normal colours. 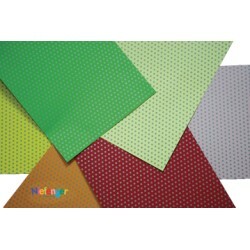 Each set contains 2 pieces of construction paper with the dots of each one of the colours and another 2 pieces of construction paper of each colour with white dots. Size of the cardboard 24x32 cm. Manufactured in fine cardboard of 300 gr./m2. Bags with 12 sheets of construction paper decorated on both sides, with dots in three fluorescents colours. 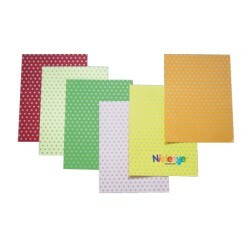 Each set contains 2 pieces of construction paper with the dots of each one of the colours and another 2 pieces of construction paper of each colour with white dots. Size of the cardboard 24x32 cm. Manufactured in fine cardboard of 300 gr./m². 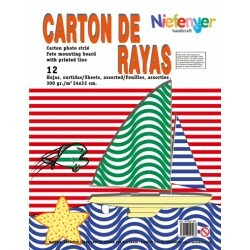 Bags of 12 pieces of construction paper decorated on both sides, with squares in three normal colours. 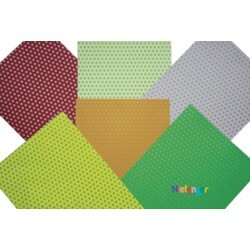 Each set contains 2 pieces of construction paper with the squares of each one of the colours and another 2 pieces of construction paper of each colour with white squares. Size of the cardboard 24x32 cm. Manufactured in fine cardboard of 300 gr./m². Bags of 12 pieces of construction paper decorated on both sides, with squares in three fluorescents colours. 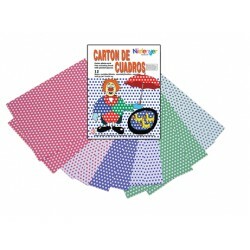 Each set contains 2 pieces of construction paper with the squares of each one of the colours and another 2 pieces of construction paper of each colour with white squares. Size of the cardboard 24x32 cm. Manufactured in fine cardboard of 300 gr./m². 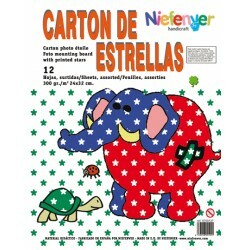 Bags of 12 sheets of construction paper decorated on both sides with stars in three normal colours. 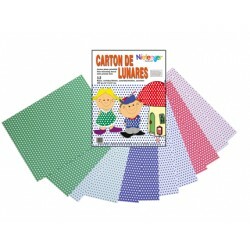 Each set contains 2 pieces of construction paper with the stars of each one of the colours and another 2 pieces of construction paper of each colour with white stars. Size of the cardboard 24x32 cm. Manufactured in fine cardboard of 300 gr./m². Bags of 12 sheets of construction paper decorated on both sides with stars in three fluorescents colours. Each set contains 2 pieces of construction paper with the stars of each one of the colours and another 2 pieces of construction paper of each colour with white stars. Size of the cardboard 24x32 cm. Manufactured in fine cardboard of 300 gr./m². 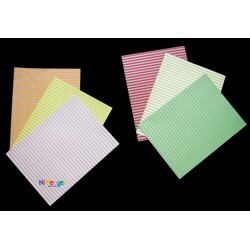 Bags of 12 sheets of construction paper decorated on both sides with stripes in three normal colours. Each set contains 2 pieces of construction paper with the stripes of each one of the colours and another 2 pieces of construction paper of each colour with white stripes. Size of the cardboard 24x32 cm. Manufactured in fine cardboard of 300 gr./m². Bags of 12 sheets of construction paper decorated on both sides with stripes in three fluorescents colours. Each set contains 2 pieces of construction paper with the stripes of each one of the colours and another 2 pieces of construction paper of each colour with white stripes. Size of the cardboard 24x32 cm. Manufactured in fine cardboard of 300 gr./m². 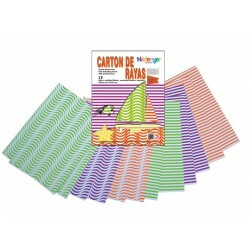 Bag of 12 sheets of colour 180 gr. Carboard. Printed with silber stars. Size 24x32 cm. 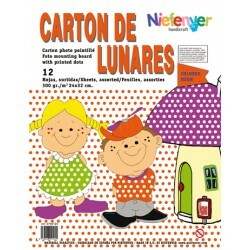 Bag of 12 sheets of colour 180 gr. Carboard. Printed with silver squares. Size 24x32 cm. 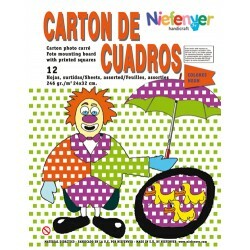 Bag of 12 sheets of colour 180 gr. Carboard. Printed with silver dots. Size 24x32 cm.